DATES: Kenneth Ernest Shinabarger was born 14 November 1911 in Cook Co. Chicago, IL. He is the son of Riley Ernest Shinabarger. Kenneth died 24 October 1976 in Bristol IN and is buried Chapel Hill Memorial Gardens, Osceola IN. 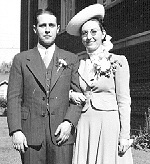 MARRIAGES: Kenneth married Rhoda Suzanne “Sue” ISTER on 7 July 1940 . Suzanne was born 9 August 1915 in Elkhart, IN. She is the daughter of Grover and Lillian Haryetta Melvin Ister. Sue died 24 May 2003 in Elkhart, IN and is buried at Chapel Hill Memorial Gardens. HISTORY: Kenneth was an electrician for Miles Laboratories in Elkhart. David Charles Shinabarger – born 9 April 1943. Paul Riley Shinabarger – born 18 August 1944. Mark Ernest Shinabarger – born 7 November 1947. Keith Alan Shinabarger – born 19 March 1949. James Lee Shinabarger – born 30 March 1955. Carl Edward Shinabarger – born 3 September 1958. Kenneth Shinabarger was an electrician for Miles Laboratories in Elkhart, IN.